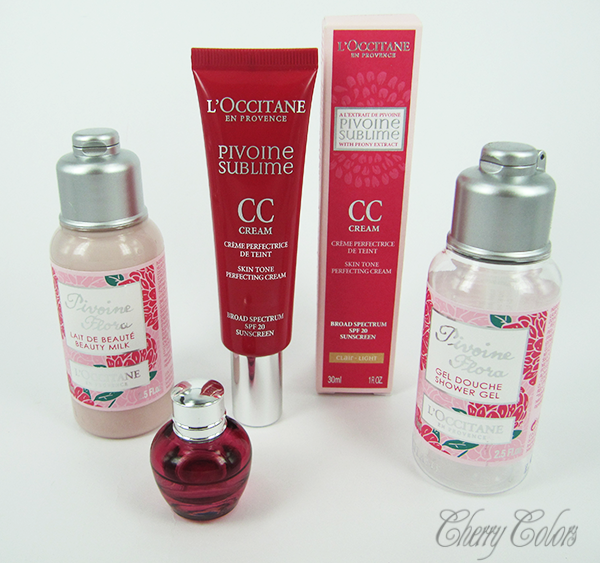 Review: L'Occitane Pivoine Sublime travel set - Cherry Colors - Cosmetics Heaven! 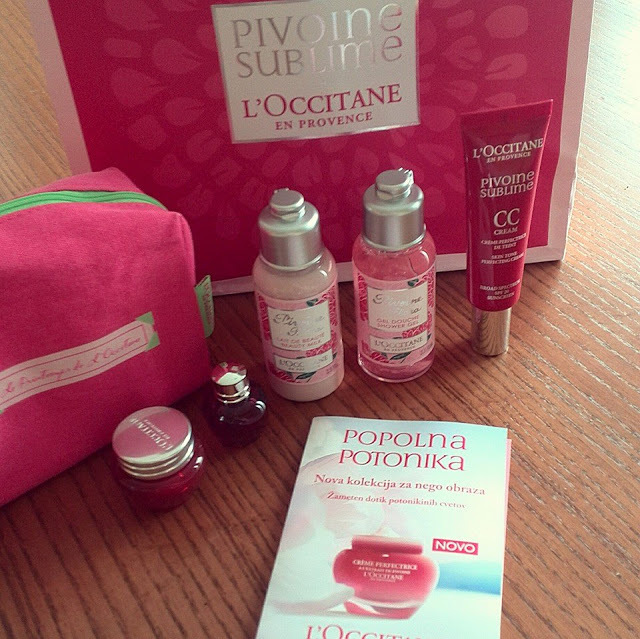 You may have read about my experience at the L'Occitane store here or a preview of the Pivoine Sublime collection here (Slovenian only). I think that I put the Mini travel set (20€) that I purchased then on the test for a long time and it's time to share my thoughts. These are the products I still have now, as you can see there's not pictured the mini face cream and I included the full sized CC cream in this photo. L'Occitane Pivoine Sublime Beauty Milk (8,60€) - The consistency and look of this body milk are that of a raspberry yogurt. A more watery one, but still similar. The scent is very close to the scent of the whole line, just a bit more plain or musky on my skin. But that may just be my skin chemistry. The milk is moisturizing but feels a bit heavier on the skin in hot days. So I think it's perfect for colder days. Even if I love the Pivoine scent, I don't think I would repurchase this body milk again. L'Occitane Eau De Toilette Flora (46,80€/75ml) - This has to be my favorite perfume ever. I just can't get bored of it. It's perfect and so fresh. Fresh and flowery and very light. I wish I could shell out the 50€ the big version of this costs because it became my to go perfume - kind of my signature one. The downside is the lasting time, it doesn't stay on for the whole day, but I don't mind since it's a bit of a ritual applying it for me. L'Occitane CC cream (Light) (28,50€) - At first I was very weary of this cream. I wasn't sure that it does suit my skin but after a longer testing time frame I realized, I was applying too much of it! So the instructions are very simple, first apply your day cream and over it, this. Since it's Summer and hot, I use my Vichy Aqualia Serum underneath and it works perfectly. After the Serum, I apply this CC cream. Not too much, just a bean-sized drop. Let me tell you something - this "foundation" clings to the skin. It doesn't go anywhere even during the hottest day. And right after application and the whole day after, my skin looks perfectly even. Bright and healthy even if it doesn't cover too well bigger acne. The bigger downside? It only lasts for 6M, I may try to put it in my fridge after that time, I mean it's precious, you know? L'Occitane Pivoine Sublime Shower gel (5,60€) - This is the first item I used up fully. The first time I used, I was so shocked how well it smelled, well how well I smelled, and after that, how well my bathroom smelled. Divine! I liked the packaging because it is squeeze proof. since I like squeezing little packages to get the goodies out, I mean how else am I supposed to get it out? And let me tell you, this little bottle lasted me a long time, so long that I wanted to use it up at the end. How long? 4 months. At the end I started using more, just to get rid of it. So I don't think I would repurchase it because it's a smell I got bored after a while, but it was fun while it lasted. L'Occitane Perfecting cream (38,10€) - I don't think I said how cute are the designs of the packaging. Super adorable! I will be saving them for "photography purposes" after I empty them up. Well, not this cream since I gave it away. It didn't work for me. I got tiny bumps while using it, but I do not know if it was because of the cream itself or my poor diet. I remember the cream being quite light but also quite heavy at the same time, also easy to apply. I wouldn't repurchase it again if I had the chance. Do you have any of the products from this line? What do you think about them?